Well it was another difficult weekend of fishing in Pennsylvania. In part due to some difficult weather conditions. After a good start last week at Lake Arthur in the Keystone Bass Buddy Circuit we decided to fish event number two on Raystown Lake. Historically, I have never done well at Raystown Lake, so we decided to head out and practice all day on Friday to find a pattern, check water temperatures and water clearity. We launched from the Seven Points Campground launch around 10:00. The weather was aweful. It was about 40 degrees and raining. I don’t mean a light rain or a sprinkle, it was a constant heavy rain. We fished several spots with no luck before we went back and set up the campsite and had lunch. After being off the water for a little while we went back out and decided that we had better check a couple of spots that we had caught fish before. We fished nearly 400 yards of shoreline at a slow to moderate pace before I decided to try a soft plastice craw bait. I made a few casts and I caught a 3lb largemouth. To be honest I barely felt the hit and even when I set the hook I wasn’t sure it was a fish. So we moved down the shore about 100 yars and I caught a dink. At that point we decided to leave that area and explore a little more. We never had another hit, and at 7:00 we decided to call it a night and go back to the tent. The next morning we went to registration at James Creek. We pulled boat 89 and secured second flight, which is what we wanted. We started by fishing the James Creek finger and worked a long stretch for the first hour. We decided to work it back up, and around 9:45 we got our first keeper on a chatterbait. It was a nice 3lb largemouth. We worked that area for a while and decided to make a move and just hit every spot on the lake that had produced in the past. Our second stop was an area that has produced smallmouth bass for us in the past. Sure enough around 12:00 we caught our lunker a 3.69lb smallmouth. We worked the spot for another hour without a bite. At that point we decided to hit the stretch that I had caught the keeper the day before. After another long Idle we started working soft plastics and jerkbaits. I missed a 2 different fish and decided to make a lure change because they had never hooked up. Sure enough the move to a different bait the the key because in the next 20 minutes I caught 2 more keeper largemouth. We worked the area for the rest of the day but those fish that I caught around 2:00 were the last ones we caught. Overall we had little expectations coming into the event and even less after practice. However, this goes to show you that you can draw off of past experience and new knowledge and still have a good day on the water. 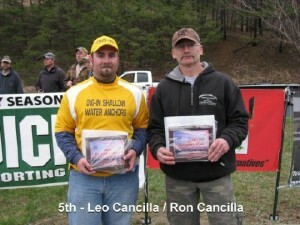 Our 5th place finish with 4 bass that weighed 12.18 pounds has moved us up to 2nd in the AOY standings. It is a good start that hopefully continues in the KBBC tournament trail. On Sunday the West Penn Bass Hunters had our first club tournament. We started our season at Lake Wilhelm under great weather conditions, but struggled. There were only 6 bass brought to the scales. 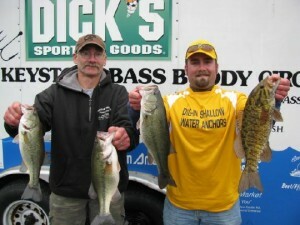 A great finish by Jon who had the only 3 fish limit and finished 1st with lunker. I managed to finish 3rd with my 1 keeper. Look for that lake to really turn on this week. The water temps are rising and the clearity is pretty good. The baitfish are not hard to find, but making fish to eat was a struggle this weekend. Good job to all that caught fish and see everyone at Pymatuning.